I found these beautifully crafted accessories and decorations at ForMyDarling's shop on Etsy. 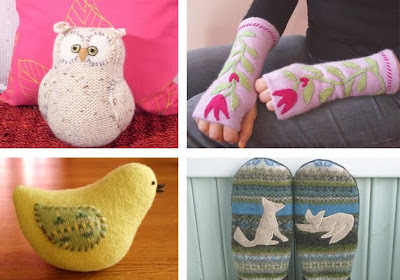 They are all made from re-purposed wool and felt, and they bring a second chance for life to dull and forgotten things (and we all have some of those stashed somewhere in our closets). 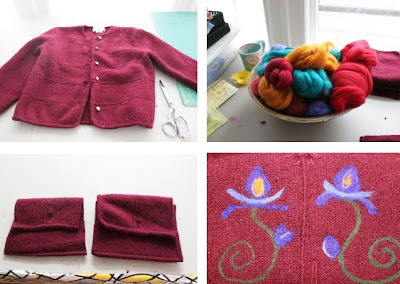 I also like what Liz Noonan has done with a red wool sweater that once belonged to her dear granny - she turned it into two wool purses (with floral designs, which she did herself) for her daughters. She also has the tutorial, so if you like to create something new from a piece of clothing you can't seem to let go, you can see the tutorial here. Love that yellow bird! And thanks for posting about the sweater! Monday I'll have pics of the finished product.